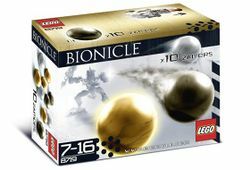 8719 Zamor Spheres is a BIONICLE set containing 10 Zamor Spheres that can be used in a Zamor Launcher. Zamor Spheres are a kind of weapon in LEGO BIONICLE storyline, first appearing in the Legends story arc. They are essentially hollow balls; gas, liquid, or energy can be put into them, depending on what effect is desired. The spheres are then fired by Zamor Launchers at the target, where the solid surface temporarily becomes intangible and the substances inside them pass through the target. The earliest known Zamor Launcher was used by Toa Jovan, roughly 79,000 years earlier than the Piraka and Toa Inika used them. The ancient weapons were recently rediscovered, and modern Zamor Launchers were first designed by the Vortixx weaponsmiths. Prototypes were then sold to Matoran on an unknown island some 3,000 years ago; but were stolen by Nidhiki and Krekka for the Dark Hunters (at some time before this Nidhiki was mutated into his insectoid form). Their mission also included destroying the production machinery, to delay the Matoran from making more launchers quickly. Recently, a group of Dark Hunters abandoned the organization. Calling themselves "Piraka", they traveled to Voya Nui to search for the Mask of Life; their weapons builder, Avak, built Zamor Launchers for each of them to use in their schemes and the leader, Zaktan, built a vat to collect a virus called "Antidermis" that would fill the Zamor Spheres. But some of Voya Nui's Matoran opposed the Piraka, and they managed to steal one of the Zamor Launchers. After studying it, the group's inventor, Velika, built a set of launchers of his own and gave them to the Matorans' new allies, the Toa Inika. The Inika's launchers are upgraded from the Piraka's, as they can hold up to four spheres instead of just one. The Piraka load their Zamor Spheres with "Antidermis" - a kind of greenish-black virus. Matoran infected with this virus become mindless drones that will follow any command given to them, while Brutaka becomes stronger when he absorbs the virus. The monster Irnakk can make worst fears come true, and channels this power through his Zamor Spheres. The Zamor Spheres used by Protodax shrink targets to microscopic size permanently. The Toa Inika use Zamor Spheres loaded with energized protodermis, which acts as a cure to the antidermis virus. Toa Jovan used yellow-orange Zamors that nullified the abilities of enemy weapons. "Gold - Reverses the effect of the zamor used to steal Brutaka's powers -- so essentially a power siphon"
"Silver - Binds a target to the next nearest living being with an energy chain"
"Black - 'Marks' a target so that he can be tracked anywhere he goes via an energy pulse." The Zamor Spheres also work with the Midak Skyblasters. Hakann made a Zamor Sphere with some of Vezok's absorb-power ability, and used it to steal Brutaka's power for himself (and Thok, who was touching him at the time). This sphere was described as gold in BIONICLE Legends #3: Power Play but shown as blue in the BIONICLE: Ignition comic. The golden sphere described above is one-of-a-kind in storyline: four Piraka made a Zamor Sphere that reversed the effects of the one that strengthened Hakann and Thok, returning the power to Brutaka. Axonn gave Toa Jaller a glowing Zamor Sphere, saying that the Mask of Life needs "protection". When utilized, the sphere froze Vezon and Kardas in space and time so that the Mask could safely be claimed. Each of the 2006 canister sets included four Zamor spheres: Every Piraka had yellow-green spheres; Toa Jaller and Toa Hahli had light green spheres, Toa Kongu and Toa Matoro had blue spheres, and Toa Hewkii and Toa Nuparu had orange-yellow spheres. Each of that year's playsets also included both blue and green spheres, and the Zamor pack included gold, silver, and black spheres. The Mahri Nui Matoran and Hydruka sets also include two orange-yellow sphere pieces apiece (though in the storyline they aren't Zamors, but rather solidified air bubbles). This makes for six to eight sphere colours to collect, depending on whether you consider the Piraka and Inika greens and the Inika and Mahri Nui orange-yellows as the same or different from one another. It should be noted that a majority of the Zamor Spheres in the toy sets are different colours from what the storyline says. The Piraka's Zamors are yellow-green, while storyline says that antidermis is greenish-black. Similarly, the Toa Inika Zamors are of various colours, but in the story they are filled with energized protodermis, which is silver in colour and glows silver white. In BIONICLE Heroes , the player has to retrieve one in the second level in every zone (excluding Vezon's Awakening) The Toa Inika, however, never used them during gameplay. This is a description taken from LEGO.com. Please do not modify it. (visit this item's product page) Load and launch the zamor spheres! The zamor spheres are a mysterious new power in the BIONICLE® universe, and they are available in these awesome packs. Each color sphere has a different power! Load your zamor launcher and watch them fly! The zamor sphere has seen various uses throughout more recent LEGO sets including meteor blasters/lava sphere shooters form Hero Factory, Midak Skyblasters, and Ninjago dragon breath, and meteors in the Games Theme. General information comes from the BIONICLE Legends book series; see List of BIONICLE media. This page was last edited on 9 February 2019, at 23:25.